In episode 205 of the Hop Cast Ken Hunnemeder and Brad Chmielewski are joined by Tom Korder of Penrose Brewing to chat about Belgian beers. 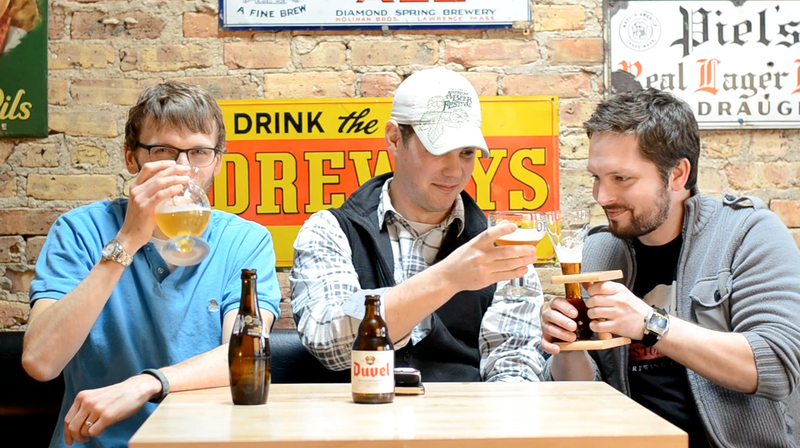 Since Tom is a Belgian beer lover, Ken and Brad thought he’d be a perfect guest to have on the show and there is no better place in Chicago to talk Belgian beers then at the Hopleaf. Three people, three beers… hey, everyone needed their own. Ken, Brad and Tom talk about what makes Belgian beers so special, as well as the differences between Trappist and Abbey beers all while sipping on an Orval, a Duvel and that beer that comes in that crazy glass, Kwak. Everyone has their favorite Belgian beer and these are a few of our favorites that should be pretty easy for you to find. Grab yourself a bottle, find that proper glassware and tune in. Having issues watching this video? Try the Quicktime (380.9 MB). Oh okay – I was going off the posted date for the video then. My apologies. Good stuff. Been getting in to the Belgiums more and more, so far just had a couple westmalle’s and a couple trappist rocheforts…definitely different then the IPA’s I’m used to.